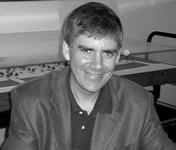 Rick Riordan is an award-winning writer. He lives in San Antonio, Texas, with his wife and two sons. Percy Jackson and the Lightning Thief was the overall winner of the Red House Children’s Book Award in 2006, and made into a blockbuster film in 2010. The series has gone on to become a chart-topping success. Listen to the author read the first chapters at Rick Riordan’s website or the Percy Jackson website. CLICK HERE FOR MORE BOOKS BY RICK RIORDAN. Percy Jackson and the Olympians — (2005-2014) Ages 9-12. Publisher: Percy Jackson is a good kid, but he can’t seem to focus on his schoolwork or control his temper. And lately, being away at boarding school is only getting worse — Percy could have sworn his pre-algebra teacher turned into a monster and tried to kill him. When Percy’s mom finds out, she knows it’s time that he knew the truth about where he came from, and that he go to the one place he’ll be safe. 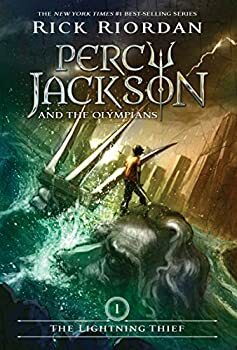 She sends Percy to Camp Half Blood, a summer camp for demigods (on Long Island), where he learns that the father he never knew is Poseidon, God of the Sea. Soon a mystery unfolds and together with his friends — one a satyr and the other the demigod daughter of Athena — Percy sets out on a quest across the United States to reach the gates of the Underworld (located in a recording studio in Hollywood) and prevent a catastrophic war between the gods. CLICK HERE FOR MORE TITLES RELATED TO PERCY JACKSON. Rick Riordan’s five-book series takes the world of Greek mythology, complete with gods, monsters, titans, Mt. Olympus, heroes, etc. and weaves it into the modern world under the premise that as the gods are manifestations of Western culture and move as the culture moves. And so when Athens was the pinnacle, Mt. Olympus was in Greece, but now that the seat of Western power has moved to America, Mr. Olympus is on the 600th floor of the Empire State Building. We all move through a sea of mythical creatures but we don’t see any of them thanks to the cloak of the Mist, a strange phenomenon that either hides them completely or makes mere mortals see the creatures and their actions as somewhat explainable (if sometimes odd) events that we can understand. I had been hearing good things about Rick Riordan's young adult fantasy series, but it wasn't until a half-price sale at the bookstore and the release of the movie (which I still haven't seen) that I finally decided to catch up with the bandwagon. I knew that it followed the basic premise of the typical coming-of-age drama in a fantasy setting, in which a troubled youngster discovers that he has innate power and a lot of trouble to go with it. To harness his power, achieve his goals, and discover his place in his newly discovered world is Percy Jackson's ongoing character arc. Though it is clearly inspired by the success of Harry Potter (right down to the format of the titles: variations of "Hero's Name and the Intriguing Noun"), it's never openly derivative. Truth be told, I wasn't hugely impressed with the first Percy Jackson book, The Lightning Thief. It was entertaining, yes, but somewhat convoluted, derivative and predictable. Well, with Percy Jackson and the Sea of Monsters, I take it all back. With a more rewarding plot, stronger characterization, and smoother pacing, the second book in the five-part series is an improvement in every respect. 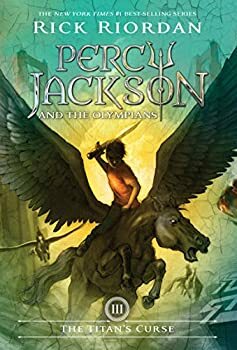 To briefly bring you up to date: the five-part Percy Jackson series revolves around updated versions of the Greek gods and their half-blood children. With Olympus currently situated in New York, many of the gods' children (who often don't know who their godly parent is, having been raised by their mortal one) attend Camp Half-Blood where they can learn to control their abilities and fend off the monsters that they attract like magnets. 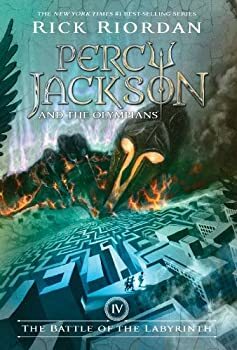 Percy's coming-of-age story involves him undertaking number of dangerous quests to defeat the growing power of Kronos, an ancient Titan who wants to overthrow Olympus. The Last Olympian is Rick Riordan’s conclusion to the well-received Percy Jackson series which involves the attempt by Kronos, the titan displaced ages ago by Zeus and the other Olympians, to rally his fellow titans, as well as assorted monsters, demigods, and disgruntled minor gods, to take down the Olympians and their allies, especially the Olympians’ children — the demigods of Camp Half-Blood led by Percy Jackson (son of Poseidon), Annabeth (daughter of Athena), and Grover (a satyr). The Heroes of Olympus — (2010-2014) Ages 9-12. Sequel to Percy Jackson and the Olympians. 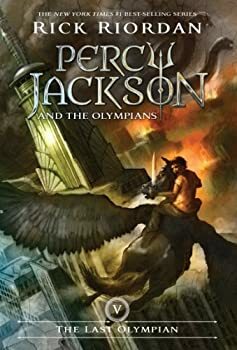 Publisher: After saving Olympus from the evil Titan lord, Kronos, Percy and friends have rebuilt their beloved Camp Half-Blood, where the next generation of demigods must now prepare for a chilling prophecy of their own: Seven half-bloods shall answer the call, To storm or fire the world must fall. An oath to keep with a final breath, And foes bear arms to the Doors of Death. Now, in a brand-new series from blockbuster best-selling author Rick Riordan, fans return to the world of Camp Half-Blood. Here, a new group of heroes will inherit a quest. But to survive the journey, they’ll need the help of some familiar demigods. CLICK HERE FOR TITLES RELATED TO THE HEROES OF OLYMPUS. 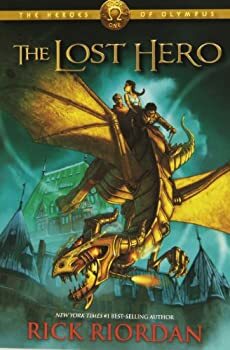 Rick Riordan’s The Lost Hero picks up shortly after his Percy Jackson & The Olympians series ended and continues onward in the same universe with both new and familiar characters. Actually, I should say “mostly” the same universe, as Riordan has broadened his Greek mythology premise to include the Roman gods as well (or as is often the case, the familiar Greek gods in their less-familiar Roman aspects). Warning: Contains some mild spoilers for the previous book, The Lost Hero. 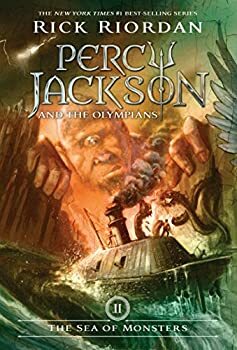 First, a brief reminder of where this book stands among Rick Riordan's collection of YA novels: it is the second book in the HEROES OF OLYMPUS five-part series, which itself is the sequel series to the original PERCY JACKSON books. Suffice to say, if you're unfamiliar with the stories published before this one, you're likely to be hopelessly lost in understanding what's happening here. Head back to Percy Jackson and the Lightning Thief and work your way up. 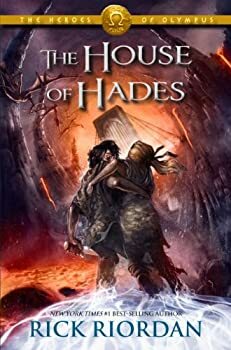 This is the third book in the five-part HEROES OF OLYMPUS series by Rick Riordan, and as the title would imply, it focuses on Annabeth Chase: daughter of Athena. 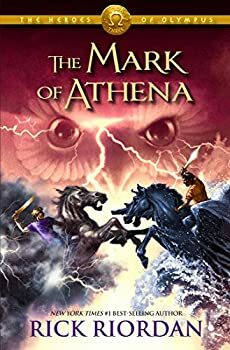 Though it suffers a little from middle book syndrome, with nothing started and nothing finished, Riordan makes sure that Annabeth's quest remains the key focus of the book, letting it drive the course of the otherwise sprawling narrative. The seven heroes of the prophecy have been assembled: Percy, Annabeth, Leo, Hazel, Frank, Piper and Jason; all of whom have a vital part to play in the defeat of the goddess Gaea, who has been awakening both giants and the dead in her bid to destroy the Olympian gods. 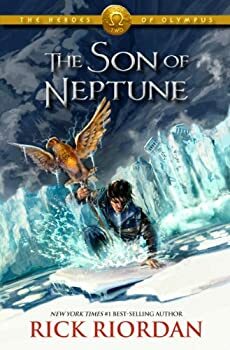 It's been nearly two years since I read the last book in Rick Riordan's five-part THE HEROES OF OLYMPUS series — not because I wasn't enjoying it; I simply got swamped by my never-ending To Be Read pile. But I'm back, and eager to finish what I started! 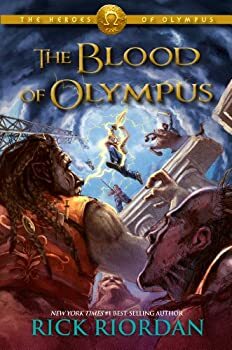 The fifth and final book in THE HEROES OF OLYMPUS pentalogy sees our seven demigods finally go up against the threat that's been brewing for the last four books: Gaia, the primordial goddess who's been deliberately pitting the Greeks and the Romans against one another. With the training camps of young half-blood youths preparing for war and many of the gods torn between their Greek and Roman personas, our young protagonists have only a prophecy to guide their quest for peace: one that suggests they're not all going to make it out alive. The Kane Chronicles — (2010.-2013) Ages 9-12. Publisher: Since their mother’s death, Carter and Sadie have become near strangers. While Sadie has lived with her grandparents in London, her brother has traveled the world with their father, the brilliant Egyptologist, Dr. Julius Kane. One night, Dr. Kane brings the siblings together for a “research experiment” at the British Museum, where he hopes to set things right for his family. Instead, he unleashes the Egyptian god Set, who banishes him to oblivion and forces the children to flee for their lives. Soon, Sadie and Carter discover that the gods of Egypt are waking, and the worst of them — Set — has his sights on the Kanes. To stop him, the siblings embark on a dangerous journey across the globe — a quest that brings them ever closer to the truth about their family, and their links to a secret order that has existed since the time of the pharaohs. CLICK HERE FOR TITLES RELATED TO THE KANE CHRONICLES. The Red Pyramid: Why mess with a good thing? 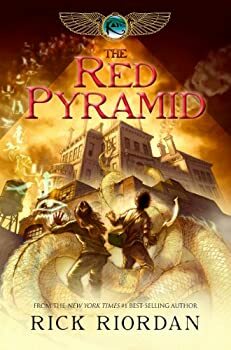 The Red Pyramid (2011), by Rick Riordan, starts readers off on a new series intermingling ancient mythology, today’s world, and snappy young teens. In this case, though, the mythology is Egyptian, not Greek as in his Percy Jackson series (or Roman, as in the newest addition to that series) and the young teens aren’t the sons and daughters of gods but are instead possessed by them (if that doesn’t seem like much of a difference, it’s because it really isn’t as the story plays out). This may seem overly familiar, but “why mess with a good thing?” is probably Riordan’s thinking, and my guess is his fans’ as well. 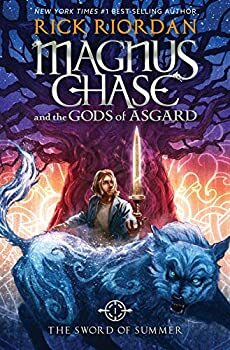 CLICK HERE FOR MORE TITLES RELATED TO MAGNUS CHASE. 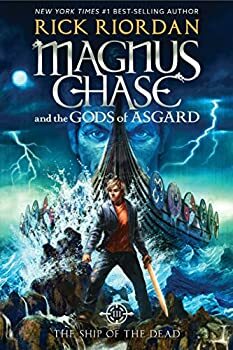 Rick Riordan, who has enthralled millions of readers with exciting tales of teenagers and their interactions with Greek, Roman and Egyptian gods and goddesses, turns to Norse mythology in his latest book, The Sword of Summer, published October 6, 2015. When Naglfar ― a ship made out of the fingernails and toenails of the dead, eek! ― sets sail, carrying hordes of giants and zombies warriors to fight the gods of Asgard, Ragnarok and a world-ending battle aren’t far behind. Ragnarok can’t be entirely avoided (unfortunately, it’s an inevitable prophecy), but perhaps it can be delayed for a while longer?